Indirect laryngoscopy – a medical procedure, visual inspection of the pharynx, larynx and vocal cords. There are several varieties of this examination, but the indirect method is used most often. This procedure simplifies the process of diagnosis of diseases of the upper respiratory tract and to identify pathological changes in their structure. Indirect laryngoscopy is used on the strict condition in connection with the possibility of development of various complications. The procedure must always take place in a medical institution. The study of the larynx and vocal cords are often used in the diagnosis of ENT diseases and pathology of the respiratory system. Prolonged voice changes or loss. Foreign body sensation in the larynx or pharynx, dysphagia. Traumatic lesions of the pharynx or larynx. Breathing disorders that are not associated with lesions of the trachea, bronchi or lungs. Decompensated diseases of internal organs (respiratory, cardiovascular, and other systems). Severely impaired breathing in the narrowing of Airways. Acute inflammatory diseases of the pharynx, nasal cavity and larynx. 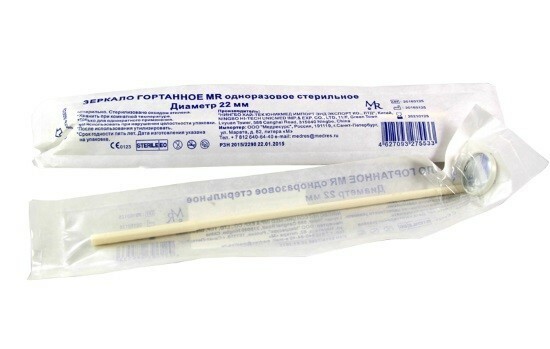 Allergic reactions or hypersensitivity to medication drugs used for examination of the larynx. The holding of such examination does not require compliance with any special measures. However, there are some nuances that need to pay attention. Each patient one to two days before the study must undergo a clinical examination, and pass a General analysis of blood and urine to detect hidden pathologies, in particular of an inflammatory nature. Doctor should interrogate the patient about the Allergy in case of possibility of applying local anesthetics. 3-5 hours before research one should abstain from eating and drinking to empty the stomach and prevent vomiting can lead to aspiration syndrome and severe pneumonia. If the patient has dentures, they should be removed. 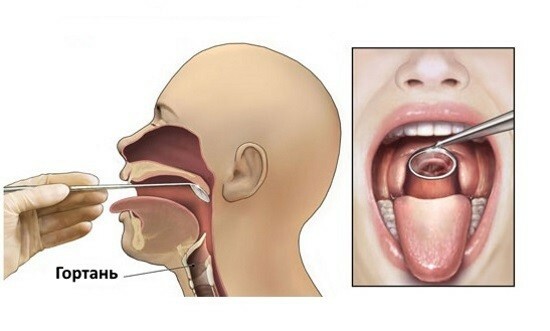 The use of a special mirror that allows the doctor to examine the larynx and vocal cords without the use of complex equipment. The procedure is carried out as follows: the doctor sits opposite the patient and fixes his language with a small gauze or vintovoi swipe of his left hand. Pre-heated mirror (this needs to be done to prevent it fogging) is introduced into the mouth and promote to oropharynx, pushing a uvula. It is important to promote the mirror carefully without touching the backrest and the root of the tongue. Otherwise, it may cause a gag reflex. If the patient has elevated gag reflex, it is possible to use local anesthetics to blockade. However, in such case, it is important to make sure the patient has no allergies to similar medicines. Proper conduct indirect laryngoscopy allows a good look at the larynx and the vocal cords and rings of the trachea. It is possible to identify accumulations of mucus, pus or crusting. These nuances are used for the detection of pathological processes and diseases. Traumatic injury and inflammatory changes in the larynx. Benign and malignant tumor growth in the wall of the larynx and in the region of the vocal cords. A foreign body in the lumen of the organ. Proliferation of connective tissue, cicatricial changes. Disorders in motility of the vocal cords, their dysfunctional disorders. READ Metastases in the lungs on an x – ray look like? Obtaining such information can play a crucial in the diagnosis of diseases of the hypopharynx, larynx and vocal cords. The results of the laryngoscopy should assess only physician with extensive experience in conducting this procedure. Properly performed laryngoscopy almost never leads to the development of complications. However, sometimes there is an exception to this rule. Most frequently observe the patient’s nausea or vomiting related to their reflex start. However, vomiting may be the result of improper preparation of the patient for the survey. In this case, vomiting may be complicated by the more severe processes, e.g., aspiration, bronchitis and pneumonia. In some cases, may be spontaneous laryngospasm, which leads to difficulty breathing. It is necessary to highlight medical complications, namely the development of allergic reactions (urticaria, Quincke’s edema, anaphylactic shock etc.) and reactions of individual intolerance to the medication. A similar situation can occur when using during the procedure, local anesthetics. Thus, indirect laryngoscopy is a simple and convenient method for the evaluation of the pharynx and vocal cords, does not require special training or complex equipment. When this physician gets the opportunity of visual inspection of the upper parts of the respiratory system and identify the structure of pathological processes. The use of this method spread in the context of clinical examination and examinations in the clinic. Elevated direct and indirect bilirubin: what does it mean?